The Exigo Smith Machine Counter Balance is a superb machine that accommodates all users. Part of our industry leading plate loaded range. The counter balanced design significantly reduces the weight of the bar making this a great piece of kit for beginners. The stainless steel pins minimise wear and tear and the high quality 30mm linear bearings and chromed bar allow for smooth operation. Six Olympic weight horns are fitted as standard for convenient storage; useful for commercial gyms. In addition the frame work is angled at 5 degrees for a bio mechanically correct motion. Engineered with a heavy duty frame and premium components, our Smith Machine is ready to withstand a lifetime of heavy workouts. Complete with a durable high quality epoxy powder coated finish. 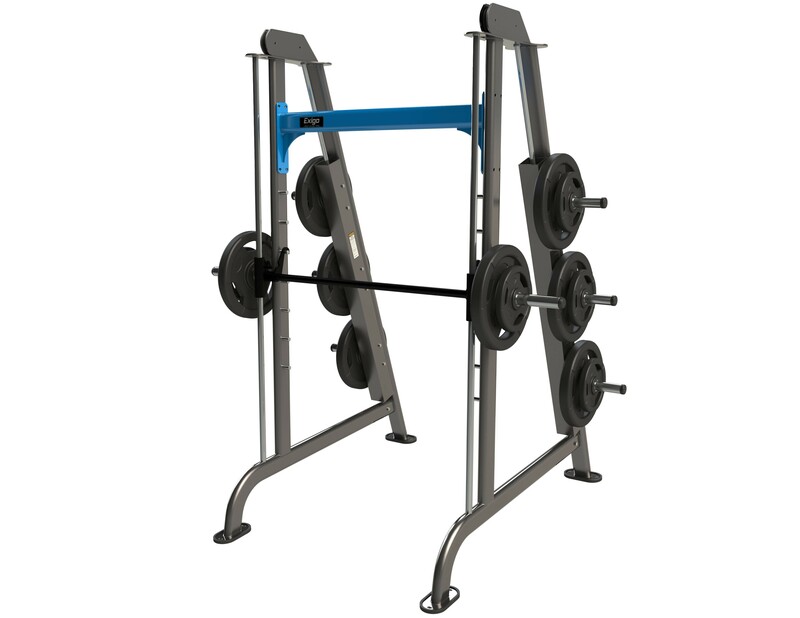 The Exigo Smith Machine Counter Balance is a must for any gym or training facility. Proudly designed and manufactured in our very own UK factory with a mainframe lifetime guarantee. A superb machine that accommodates all users Part of our industry leading plate loaded range The counter balanced design significantly reduces the weight of the bar Stainless steel pins minimise wear and tear High quality 30mm linear bearings and chromed bar allow for smooth operation Six Olympic weight horns are fitted as standard for convenient storage Frame work is angled at 5 degrees for a bio mechanically correct motion Ready to withstand a lifetime of heavy workouts Complete with a durable high quality epoxy powder coated finish Designed and manufactured in our very own UK factory Mainframe lifetime guarantee.